Overwatering is a common mistake by homeowners and Irrigation companies alike. Most think the more water, the better. Each season requires its own unique scheduled settings. With the heavy rains in the Indiana Spring, your system does not need too much work. However, we all know the Indiana summers can lack rain, and be tough on all aspects of your lawn. Here are some signs to look for during all seasons of the year. The blades of grass are wilted and limp. There is increased mowing due to thicker thatch growth. Your lawn remains soggy for long periods of time. Did you know? Overwatering can lead to lawn disease. Root Rot – A fungal disease that starts at the root system. This causes the lawn to turn yellow and brown. Moss – This usually appears in moist conditions and in shady spots. Brown Patch Lawn Disease – A turf fungus that creates brown circles in the lawn. The grass blades are wilted and feel dry. The grass does not spring back when stepped on. There is a slower blade growth. It’s important to keep a lookout for signs that your lawn is healthy and growing at an appropriate rate. There is an even color range of green. The grass blades bounce back right away after being walked on. There is an even thatch at soil level. 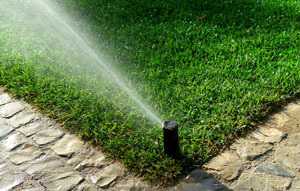 Run your irrigation system during the morning hours. Less water is lost to evaporation when the temperature is cooler, plus in most areas the wind doesn't blow as hard in the mornings. Watering in the evenings can lead to turf and plant disease problems because the water sits on the plants all night, especially in humid climates. Solution = Allow our service technician to program your control panel for maximum efficiency. If you irrigate with automatic sprinklers, program your irrigation timer so that it waters in 1-2 short cycles rather than a single long period of time. Allow the water to soak in to the ground between the cycles. Watering every day is NEVER recommended unless you are installing new sod. Most controllers even have a % key that makes changing the time quick and reasonably painless. Solution = Use the “Seasonal Adjustment” feature on your control panel to maximize your sprinkler system features. Our technicians have extensive knowledge in this area. Ask how this feature works when we come out for your system start up. Do your sprinklers spit and spew air mixed with water for a short period each time they are turned on? This is caused by a phenomena called "low head drainage". Low-head drainage occurs when the sprinkler system has been installed on a sloped area. After the sprinklers are turned off, the water in the pipes drains out through the lowest sprinkler heads and is replaced by air. The water that drains out is wasted, and often flows into the gutter or creates a muddy area around the lowest sprinkler head or drip emitter. Then the air is violently forced out the next time you run the sprinklers. This puts a lot of stress on the sprinklers and pipes. The easiest way to tell if you have this problem is when you turn on the sprinklers. If they spit and spew air when the valve is turned on, then you have low head drainage.